The equipment design solution is being used for the construction of twin bridges in a 126m link that forms part of the new E311 highway that is expected to cut down travel time and congestion on the current E11 highway between the two Emirates. The new link is a significant part of the Abu Dhabi Plan 2030 infrastructure programme. The twin bridge is one of seven structures, including six bridges and an underpass, that make up the 28km section of the new link road. Once completed, the total length of the bridges for the project will be 1km. 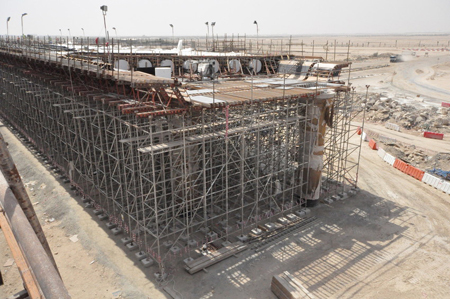 Although contractor Salini already had some formwork and shoring equipment from RMD Kwikform, the company required additional design and site support to provide a viable tender to the Department of Transport in Abu Dhabi for the simultaneous construction of the twin bridges and abutments. Salini is part of a joint venture with Tristar Engineering and Construction, who is responsible for the road building section of the project. As Salini’s fleet did not hold sufficient stock of the Rapidshor heavy duty galvanised modular steel shoring system to complete the project, the RMD Kwikform team suggested a solution that combined the existing steel shoring with Rapidshor aluminium shoring, which reduced the need for hired items. In addition, the engineering team designed the formwork solutions using Alform and Superslim Soldiers beams for the large abutments. In February the Abu Dhabi General Service Company announced that the construction of the new eight-lane highway was 70% complete and expected to be finished by the end of the year.